Check out our new lower, competitive pricing. Product* Size Gauge Case Case Wt. 11x18/12x18/14x26 1.6/2.5 MIL LDPE 500/250 12/14/16 lbs. Select the appropriate "Add" button above based on quantity of CASES you desire. If you select "Add" button in 11+ column (for volume pricing), you must order at least 11 cases on the PayPal order page. Quantities: Please read this Important note on buying bags online -- our prices are based on quantity as you will see below. If you desire a quantity between 1 and 5 cases, select the 'Add to Cart' button that corresponds with that quantity and on the next PayPal screen enter your quantity between 1 and 5. Likewise, if you select the 'Add to Cart' button for the quantities of 6-10, the quantity you enter on the next PayPal screen must be between 6 and 10. Finally if you select the 'Add to Cart' button for the 11+ quantity, the quantity you order on the next PayPal screen must be 11 or greater. Thank you. Shipping: Shipping prices are FOB Houston. We offer domestic shipping only. If you want to discuss shipping charges or use your shipping vendor for orders of 11 cases or more, please place your order by phone by calling 800-890-7056 or 281-859-4933 (in Houston). Note: DM Packaging requests the right to claim extra shipping charges if large orders are in fact placed online. Resellers: Tax exempt orders must be made by phone by calling 800-890-7056 or 281-859-4933 (in Houston). 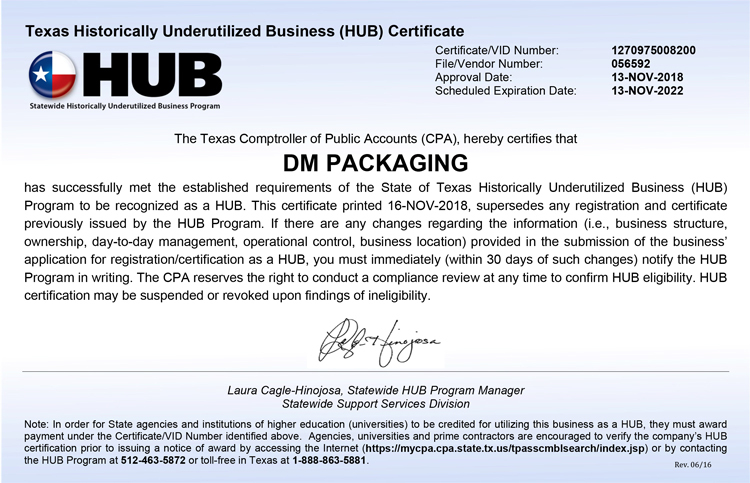 Before you place your order, please download our Tax Resale Certificate, complete it and fax it to 281-550-7936. 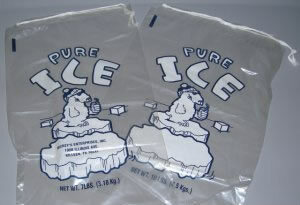 Stock Polar Bear Ice Bags 8, 10 and 20 Lb. Order your drawstring, loose or wicketed ice bags today. Urgent!!!! More Health Departments in each state are requiring store names and addresses on ice bags. Why spend the time placing labels on bags when you can order from us? We can do small-run quantities all the way up to truckloads. Bags are printed up to 8 colors. Immediate delivery on stock ice bags. We ship directly to your business. Order online or call us at 800-890-7056 for questions about your custom order. We have low minimums for custom orders - only 50 cases. -- Print leaves space for customer to stamp or print Company Name on Ice Bag for re-sell, as required by law. -- Drawsting adds convenienience for quick and easy closure. -- Drawsting eliminates need for wire or plastic ties. -- Less expensiive alternative to those operators that prefer to heat seal or use Plastic Ties to seal their own bags. DM Packaging now offers an even more impressive line of coffee bags. We provide all styles of bags including custom printed coffee bags to include name and logo. 1 lb. Coffee Bags Tin Tie 1000 per case 32 lb. *Note: All prices listed are subject to change and subject to tax and shipping.